Baseball's World Series, which starts on Tuesday, pits the Houston Astros against the Los Angeles Dodgers in the finale of the Major League Baseball season. The Dodgers are one of baseball's most powerful sides, perennial contenders in the National League (NL), but for the Astros, success has been elusive. From baseball's shortest player to the the Cuban defector nicknamed 'the Wild Horse and the star with the supermodel fiancee, here are six facts you may not know about the teams. The Astros are among eight of the 30 current Major League Baseball teams that have never won the "Fall Classic". They joined the big leagues as the Colt .45s in 1962, becoming the Astros three seasons later, but have played in the World Series only once before - in 2005 when they were thumped 4-0 by the Chicago White Sox. In 2013, after 51 seasons in the NL, they were moved to the American League (AL), where the pitchers do not bat, and a non-fielding "designated hitter" is used. The switch meant that each league now has 15 teams, and made inter-league play a regular feature. Before 1997, the only time National and American League sides played each other was in the World Series. Even after that, inter-league play was confined to a short period during each season. The Astros' first season in the AL West division in 2013 was a disaster. They finished in last place, losing 111 of their 162 games. However, they reached the postseason in 2015, pipping the New York Yankees to the AL Wild Card while this season they stormed to the AL West title with a 101-61 record, 21 wins ahead of their closest rivals. But however bad the Astros' post-season record is, it is not the worst. The Seattle Mariners have never even appeared in the World Series, nor have the Washington Nationals (or their previous incarnation as the Montreal Expos). The Astros' success this year has been based on a powerful batting line-up which led the AL in most of the important statistical categories, not least most runs scored. The key figure is Venezuelan second baseman Jose Altuve, who is the shortest player in top-flight baseball. Some believe he might not even be as tall as his officially registered height of 5ft 6ins. Altuve's height counted against him the first time he tried out for the Astros, who turned him down because he was too short. Luckily for them, he came back for a second try a year later. His diminutive stature in a game increasingly dominated by titans has caused much mirth among baseball commentators, one even working out a way to measure the distance of home runs - or anything else - in Official Standard Listed Altuves. Altuve posted the best batting average in the American League during the regular season, for the third time in four years - nobody else got close. He is also one of baseball's best infielders. Altuve's former assistant general manager David Stearns has described him as an "anomaly", adding: "He's tough to explain, other than the fact he works as hard or harder than anyone, he's got freakish hand-eye skills, he loves baseball and he wants to be great." The Dodgers are without doubt one of the glamour franchises in baseball. On Opening Day this year, they had the biggest payroll in the majors by far, with a total wage bill of $242m (£183m). The New York Yankees were in second place at $201m (£152m), while the Astros trailed back in 18th place on $124m (£94m). The Dodgers also earn more from television rights than any other team, and pull in considerably more paying spectators during the regular season to their vast Dodger Stadium, which has the biggest capacity in the majors. But for all their pulling power, the Dodgers have failed to win a World Series since 1988. That drought has been made all the more painful by watching their NL West rivals, the San Francisco Giants, win three World Series titles in the last decade. Yasiel Puig - nicknamed the Wild Horse - is one of the more colourful characters in the Dodgers' batting line-up. The Cuban right fielder is man who wears his emotions on his sleeve, never short of an extravagant gesture for every occasion. He has been in trouble on the field for making an obscene gesture to fans, and off the field for reckless driving, but all that is small beer compared to the risks he had to take just to get to the majors. After repeatedly failing to defect to Mexico, he was successfully smuggled out of Cuba in a daring and complex operation which remains shrouded in mystery. Puig and three companions had to trek for 50km on foot through dense mangrove swamps just to avoid police patrols and meet up with the team who smuggled him off the mainland from the infamous Bay of Pigs in a cigarette boat. A Mexican drug cartel is reported to have been involved, and the operation was funded by a group of US-based businessmen who expected a cut of Puig's future baseball earnings. One was imprisoned for his role. But for Puig, the risk has paid handsome dividends. He was reported to have been paid $17 (£12.89) a month to play baseball in Cuba. In 2012 he signed a seven-year deal with the Dodgers worth $42m (£31.85m). Perhaps understandably, he has been reluctant to talk about the way he escaped Cuba, but he was quoted enigmatically in Los Angeles Magazine as saying: "Sleep is when it's your time to die. For that reason I sleep with one eye open." With the division pennant a certainty weeks before the end of the regular season, Houston's owners might have rested on their laurels. Instead they made a huge statement of intent by securing one of the best pitchers in baseball, Justin Verlander, from the Detroit Tigers - right on the trade deadline at the end of August. Verlander has a glittering CV. Four times he has struck out more batters than any other pitcher in the AL over a season, and in 2011 he secured the pitching "triple crown", heading the AL in each of the three most important pitching statistics. The superstar has been an immediate success with the Astros, and struck out 13 Yankees in Game 2 of the AL Championship Series, pitching the complete game. He also brings a touch of glamour to Texas: his fiancee is the supermodel and actress Kate Upton. A World Series appearance is a huge fillip for the city of Houston, which endured traumatic heavy flooding in the wake of Hurricane Harvey in August. Across Texas, more than 80 people died. The Astros were forced to play several home games away from the city, in part because their nearest rivals, the Texas Rangers, refused to reschedule a series. When the Astros did return, a game was postponed by 24 hours so the players could visit local evacuation centres and emergency medical workers to help raise morale. Some also helped load up goods for the relief effort. Before the first pitch was thrown in the first game back at Minute Maid Park, Astros manager AJ Hinch made an emotional rallying address to fans. Since the flooding the Astros have been wearing shirts featuring the logo 'Houston Strong'. All proceeds from the sale of T-shirts bearing the message have been donated to the American Red Cross. 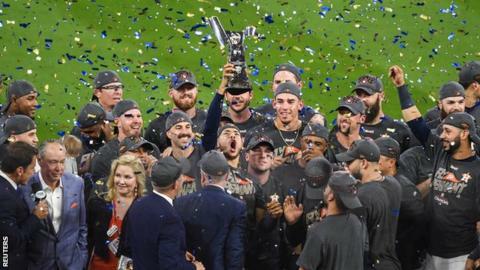 The impact of the Astros' success was summed up by a local fire brigade chief, who said: "This pennant race in Houston is a wonderful distraction from the storm recovery." Pitcher Charlie Morton, who won that first game back in Houston, said: "You want the game to lift people up. You want to do right for the city."